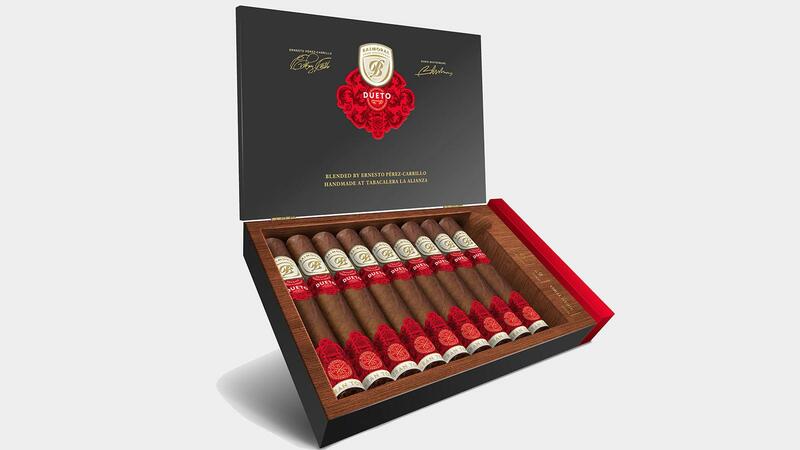 Royal Agio Cigars, makers of the Balmoral brand, has teamed up with veteran cigarmaker Ernesto Perez-Carrillo for a new line called Dueto. The Dominican-made cigar, which will debut at the upcoming IPCPR trade show in July, is said to be the first in Balmoral’s new “collaboration-based” collection, Serie Signaturas. Dueto was blended by Perez-Carrillo, owner of EPC Cigar Co., and Royal Agio owner Boris Wintermans. While the cigar is rolled at Perez-Carrillo’s La Alianza factory in the Dominican Republic, Dueto is composed almost entirely of Nicaraguan tobacco, save for some Brazilian tobacco in the filler. It wears a wrapper leaf grown in Jalapa over binder from Estelí and a mix of Brazilian and Nicaraguan filler. Dueto comes in five sizes: Robusto, measuring 5 inches by 50 ring gauge; Ovación, a figurado, at 5 1/2 by 50; Gran Toro, 6 by 52; Gordo 6 by 60; and Churchill, 7 by 49. Each vitola comes in 10 count boxes and retails between $9.75 and $12.50, depending on size. Dueto will begin shipping to U.S. retailers in September along with two other Balmoral blends: Añejo XO Connecticut and Añejo XO Oscuro. Founded in Holland in 1904, Royal Agio Cigars was started by Jacques Wintermans and is currently headed up by fourth generation Boris Wintermans. Last year, Royal Agio took back U.S. distribution of its cigar brands from Drew Estate, ending a partnership that began in 2014.